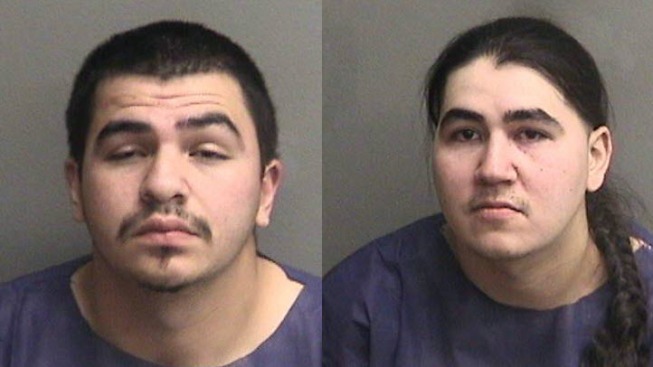 Two brothers accused of killing a father-of-four while he shopped for gifts at a Hayward Target on Christmas Eve were "good men," who only stabbed the man in self-defense, according to the suspects' sister. Frankie Archuleta, 22, and Jesse Archuleta, 25, claimed that Tyrone Griffin Jr. threatened them, saying that he “plays with guns,” their sister Destiny Archuleta said. The 36-year-old man apparently called friends to get involved in an altercation over a request that the Archuleta siblings turn down vulgar music that they were playing in the store’s toy section. It remains unclear where Griffin Jr.’s friends were as well as how and when he contacted them. A Hayward Police Department report says that "the victim grabbed a wine bottle off a shelf and hit Frankie with it." He blacked out, Destiny Archuleta said. The report also said the brothers stabbed Griffin Jr. three times in the upper torso before fleeing the scene on foot. They were nabbed in the area within hours. But Destiny Archuleta insisted, "They stay home; they go to work. They're family men." The woman added that she hopes Target’s surveillance video will prove their innocence. The Archuleta brothers didn’t go out looking for trouble. Like Griffin Jr., they too were searching for gifts, Destiny Archuleta said. "They wouldn't attack somebody for no reason," she said. But Griffin Jr.’s widow Nicole Simmons defended her slain husband. "I don’t believe he would have started it, not when my son was there," she said. "He was protective of my son." Simmons said Hayward police officers are trying to help her and her children cope with what unfolded on Christmas Eve. The family is considering counseling for the couple's four children, especially the four-year-old boy who watched as his father was stabbed to death, she admitted. Simmons said she is waiting for the surveillance footage to be released, and hopes that police will thoroughly investigate the crime. "They have to line all their ducks up," she said, so "justice is served the right way." The Archuleta family flocked to an Oakland courtroom for the suspects' arraignment on Wednesday. However, Jesse and Frankie Archuleta said that they could not afford private attorneys. Their arraignment was rescheduled for the next day and they were appointed public defenders. However, the pair waived their right to appear in court Thursday. Jesse Archuleta's attorney said it would have been "inappropriate" for his client to appear in front of the media. "When this case does end up going forward I expect that he will be fully exonerated and that he was acting in self defense," said attorney Daniel Shriro. A witness told NBC Bay Area that Griffin Jr. had asked the suspects to turn down what he considered inappropriate music while shopping with his four-year-old son at the Whipple Road Target where he was buying a last-minute gift for his daughter. Simmons set up a GoFundMe page on Tuesday. The goal amount on Tuesday was $8,000. By Wednesday, that figure had been bumped up to $45,000.